It’s fascinating how much the world has changed in just a couple of hundred years – and nothing quite shows the stark contrast like a trip to the hills. 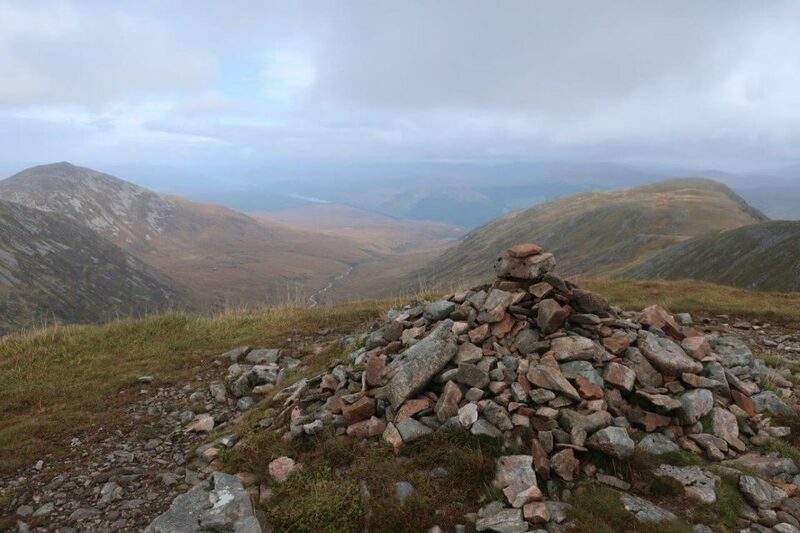 Looking down from the tops of the two Loch Lochy Munros, as they are collectively known to hill walkers, the empty glens disguise a hidden history. Climbing up towards the saddle of the Cam Bhealach. Tucked away in the vast sweep of land below Sron a’ Choire Ghairbh is a small ruin with what remains of an intermittent path leading past it. Just 200 years ago this spot, called Fedden, was a bustling halt for drovers and their cattle. The glens would have been alive with noise and movement. 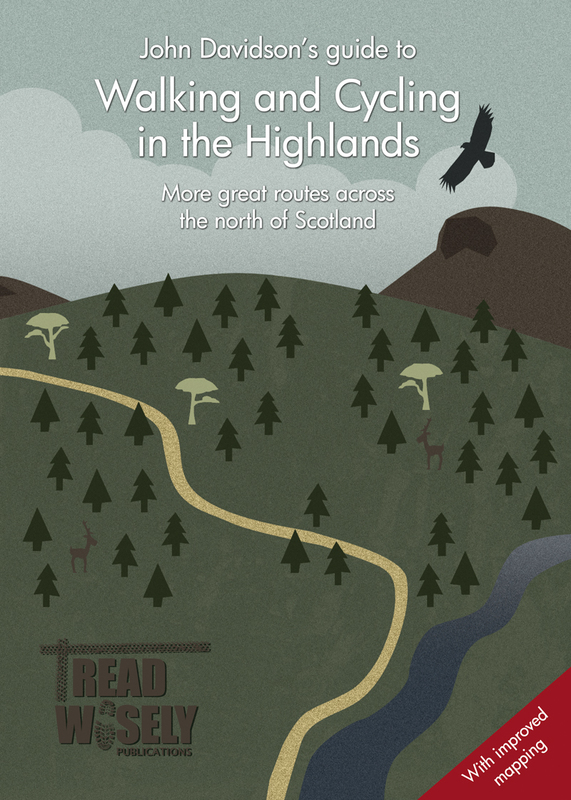 The path I’d followed up from Kilfinnan relates more to death than life – the route was one of the funeral tracks which led from the crofts of Glen Garry to the burial ground at Kilfinnan. 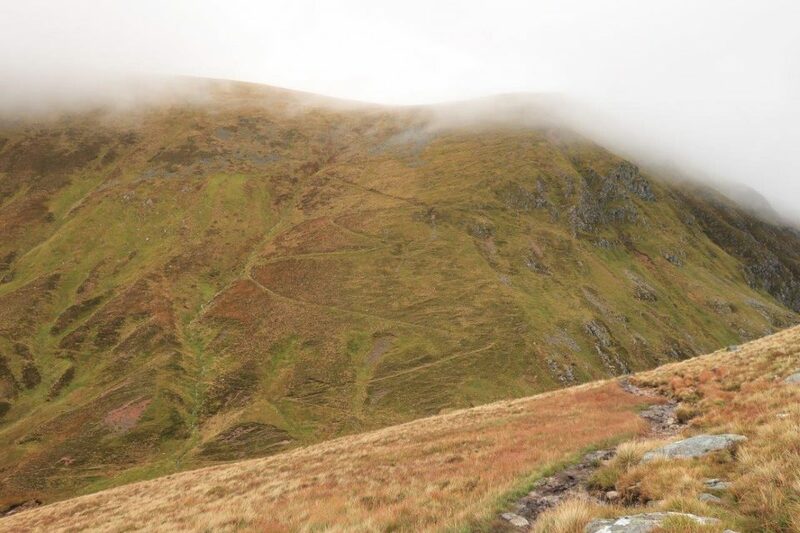 The thought of carrying the dead over this terrain is a little sombre, though its legacy is a path that leads with relative ease to the Cam Bhealach between the two Munros. With an awful forecast I’d expected the hills to be quiet today but as I arrived at the end of the road from Laggan swing bridge to Kilfinnan, where there is room to park a handful of cars without blocking access or passing places, there were already a few vehicles there. 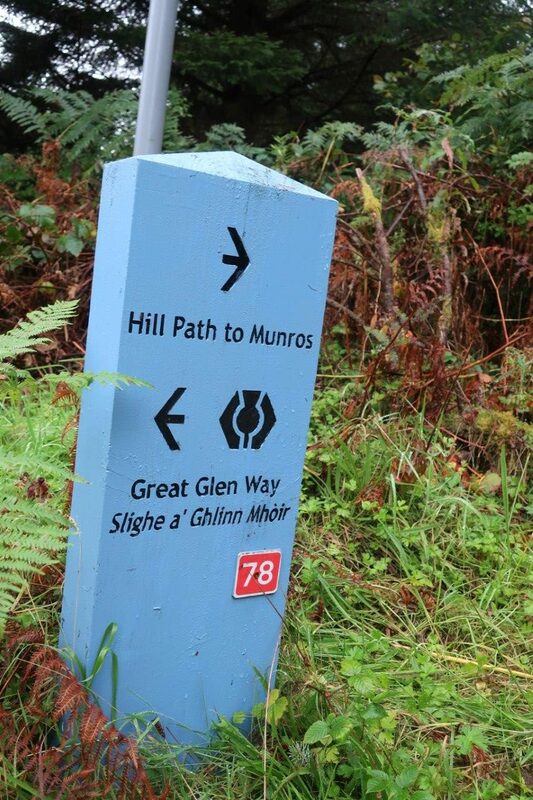 Sign at forest junction of Great Glen Way and hill path to Munros. 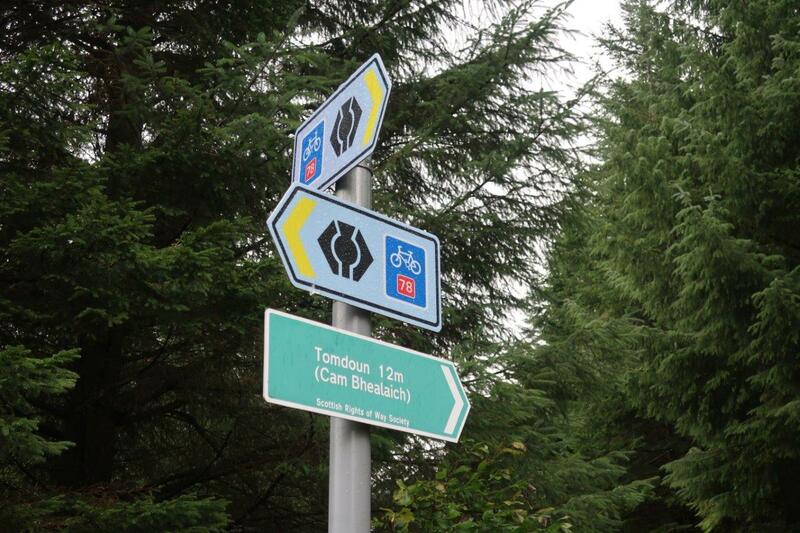 Scottish Rights of Way sign and Great Glen Way/Route 78 signs in forest. Scottish Rights of Way post marking start of Cam Bhealach path. I donned the waterproofs and headed over the bridge to walk along the track, which makes up part of the Great Glen Way and National Cycle Network Route 78. After some holiday cottages you go through a gate and continue to a junction, taking the right fork signed for the “Munros” while the GGW goes left down the hill. It’s a few kilometres along a forest track through some fairly dense plantation to the path – a stretch that could easily be taken care of by mountain bike if you preferred. 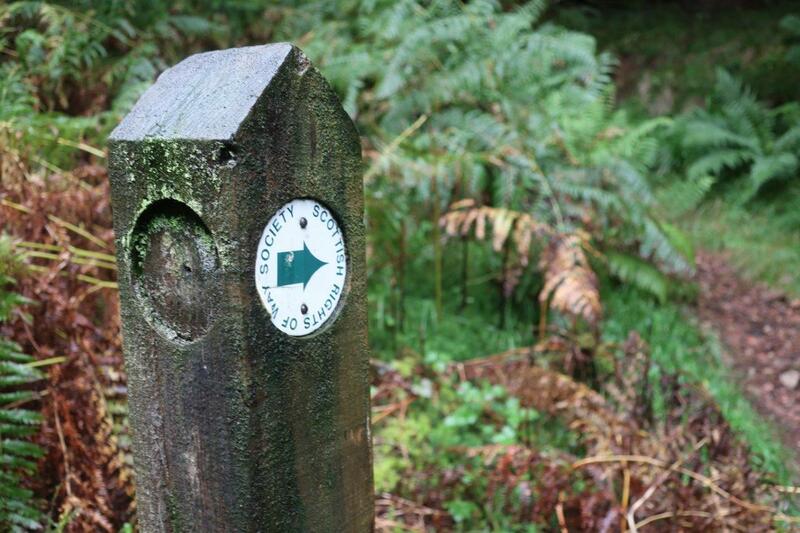 A small Scottish Rights of Way Society post can be seen among the undergrowth marking the start of the Cam Bhealach path. It climbs steeply at first through the trees, with the roaring sound of the Allt Glas-Dhoire nearby, before emerging onto the open hillside where the gradient eases. The well-made path makes the going fairly straightforward as you rise through the browning bracken towards the obvious saddle ahead. Two walkers were already heading down, having made an early start to bag the two tops in the morning, as I continued the climb. Looking across to the zigzag path up Sron a’ Choire Ghairbh. It was blustery at the bealach, and I clocked 30mph-plus gusts on my new gadget, a handheld anemometer. It’s useful for getting a real feel of the wind speed and its effect on you – or a that’s my excuse for more gadgets in the rucksack, anyway! I decided to head up Meall na Teanga, the southernmost Munro, first. At 917m it only just qualifies for the status and the route description in the Scottish Mountaineering Club guide makes it sound more dramatic than it is, referring to “scree slopes” and a “bouldery path”. 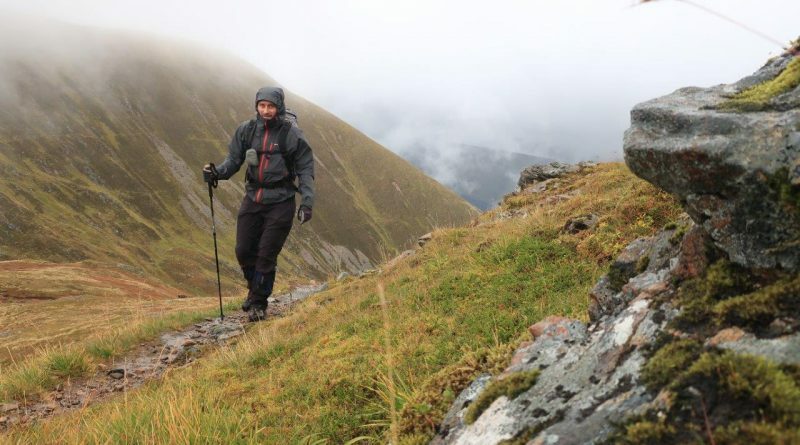 In truth, it is fairly simple to gain the col between Meall Dubh and Meall na Teanga, and the path to the Munro’s ridge only has two tiny rocky outcrops alongside it. There was some shelter in the lee of the hill here but it was ferocious on the short summit ridge, where the gadget had to come out again! I battled to stand still at the summit cairn, where I recorded a gust of 49-point-something before deciding to seek shelter on the descent and enjoy a bite to eat. Looking out towards Loch Ness from the summit of Sron a’ Choire Ghairbh. Looking across the bealach I could see the zigzag path leading up to Sron a’ Choire Ghairbh and into the cloud. From the bealach it offers an easy ascent, gaining height rapidly almost all the way to the ridge. It even started to clear as I approached the top and I got a hazy view north over Loch Oich to the southern end of Loch Ness. Having summited the Munro, I contemplated my options. 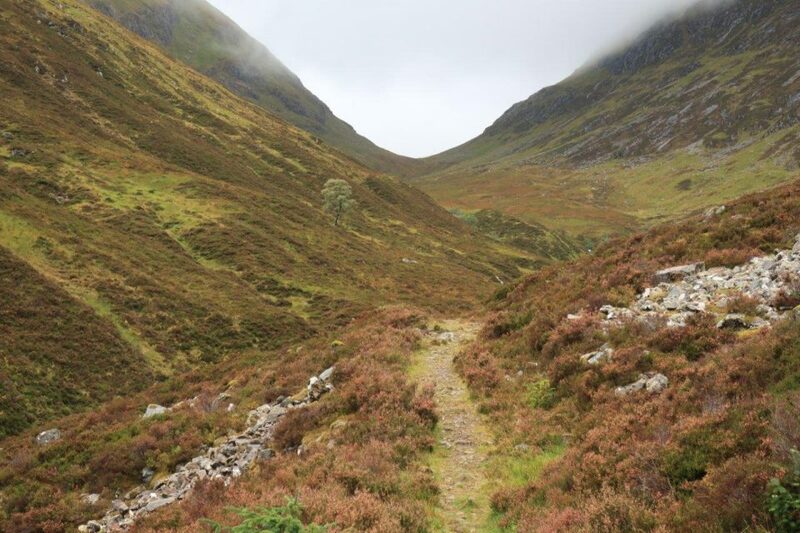 I had made much better time than expected – largely thanks to the good paths – and thought about returning via the ridge over Sean Mheall and Meall nan Dearcag. However, the gusting wind and the rough descent through crags at the end of the ridge put me off and I opted for the less adventurous but possibly more sensible option of returning again to the bealach for the long walk down to the forest.